Office supplies become tools of witness for one worker inside The Subsidiary. When power is cut and darkness ensues, when doors to the outside are locked and the PA system directs employees to stay at their workstations, the narrator documents the harrowing events in the only way he can. Deceptively simple text and graphics - rendered in desk stamps - serve to illuminate the haunting and horrifying events that occur over the next few days. Whether an apocalyptic diary or traumatic hallucination, this novel will get under your skin and into your dreams. In the subsidiary offices of a major corporation, the power suddenly goes out: the lights switch off; the doors lock; the phone lines go dead. The employees are trapped in total darkness with only cryptic, intermittent announcements over the loud speaker, instructing all personnel to remain at their work stations until further notice. Terrified, one lone worker uses the implements on his desk to give testimony to the horrors that occur during the days he spends trapped in the building, testimony told exclusively --- and hauntingly --- through the stamps he uses to mark corporate documents. 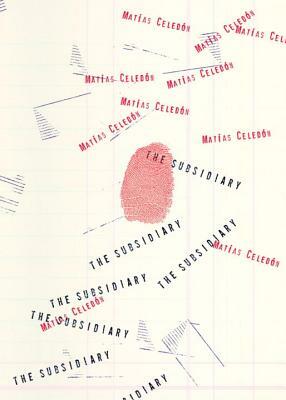 Hand-designed by the author with a stamp set he bought in an bookstore in Santiago, Matías Celedón's The Subsidiary is both an exquisite object and a chilling avant-garde tale from one of Chile's rising literary stars. Matías Celedón was born in Santiago, Chile, in 1981. He is a screenwriter, journalist, and the author of three novels. This is his first translation into English.